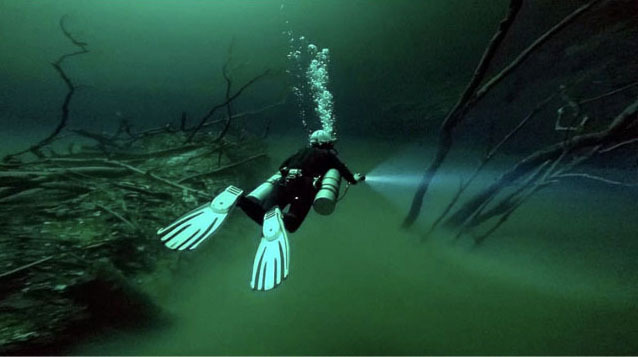 Been diving in Cenote Angelita? Please Vote! We are slowly ascending, facing one another to maintain reference. We break the surface and I try to make eye contact, but he seems distant, distracted. We inflate our wings, regulators out, masks off. This is a common reaction to diving Angelita; it is a place that is like slipping into another world. The defining feature is a thick hydrogen-sulfide cloud found at 28 meters, formed by the slow decomposition of organic matter that forms a crested heap on the bottom. Emerging from the cloud are fallen trees, allowing divers to float through a petrified underwater forest, and be momentarily part of an environment that seems to be completely frozen in time. If bottom time and gas mixture allow, an added thrill is to dip through the cloud, which obscures all vision as you pass through it. As soon as you are under, any natural light is blocked due to the density of the gas above you. All of these peculiar, even surreal characteristics can potentially cause disorientation, therefore careful planning and strong communication are necessary to reap the rewards of this uncanny locale. Map of Yucatan Peninsula, Cenote Angelita dive site.